The fire started at about 9:00 p.m. on October 8, in or around a small barn belonging to the O'Leary family that bordered the alley behind 137 DeKoven Street. The shed next to the barn was the first building to be consumed by the fire. City officials never determined the exact cause of the blaze, but the rapid spread of the fire due to a long drought in the prior summer, strong winds from the southwest, and the rapid destruction of the water pumping system explain the extensive damage of the mainly wooden city structures. There has been much speculation over the years on a single start to the fire. The most popular tale blames Mrs. O'Leary's cow, who allegedly knocked over a lantern; others state that a group of men were gambling inside the barn and knocked over a lantern. Still other speculation suggests that the blaze was related to other fires in the Midwest that day. In 1871, the Chicago Fire Department had 185 firefighters with just 17 horse-drawn steam engines to protect the entire city. :146 The initial response by the fire department was quick, but due to an error by the watchman, Matthias Schaffer, the firefighters were sent to the wrong place, allowing the fire to grow unchecked. :146 An alarm sent from the area near the fire also failed to register at the courthouse where the fire watchmen were, while the firefighters were tired from having fought numerous small fires and one large fire in the week before. These factors combined to turn a small barn fire into a conflagration. With the fire across the river and moving rapidly toward the heart of the city, panic set in. About this time, Mayor Roswell B. Mason sent messages to nearby towns asking for help. When the courthouse caught fire, he ordered the building to be evacuated and the prisoners jailed in the basement to be released. At 2:30 a.m. on the 9th, the cupola of the courthouse collapsed, sending the great bell crashing down. :148 Some witnesses reported hearing the sound from a mile (1.6 km) away. As more buildings succumbed to the flames, a major contributing factor to the fire’s spread was a meteorological phenomenon known as a fire whirl. As overheated air rises, it comes into contact with cooler air and begins to spin creating a tornado-like effect. These fire whirls are likely what drove flaming debris so high and so far. Such debris was blown across the main branch of the Chicago River to a railroad car carrying kerosene. :152 The fire had jumped the river a second time and was now raging across the city’s north side. Also likely a factor in the fire's rapid spread was the amount of flammable waste that had accumulated in the river from years of improper disposal methods used by local industries. Despite the fire spreading and growing rapidly, the city's firefighters continued to battle the blaze. A short time after the fire jumped the river, a burning piece of timber lodged on the roof of the city’s waterworks. Within minutes, the interior of the building was engulfed in flames and the building was destroyed. With it, the city’s water mains went dry and the city was helpless. :152–3 The fire burned unchecked from building to building, block to block. Once the fire had ended, the smoldering remains were still too hot for a survey of the damage to be completed for many days. Eventually, the city determined that the fire destroyed an area about 4 miles (6 km) long and averaging 3⁄4 mile (1 km) wide, encompassing an area of more than 2,000 acres (809 ha). :159 Destroyed were more than 73 miles (117 km) of roads, 120 miles (190 km) of sidewalk, 2,000 lampposts, 17,500 buildings, and $222 million in property, which was about a third of the city's valuation in 1871. 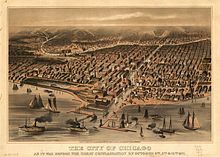 Of the approximately 324,000 inhabitants of Chicago in 1871, 90,000 Chicago residents (1 in 3 residents) were left homeless. 120 bodies were recovered, but the death toll may have been as high as 300. The county coroner speculated that an accurate count was impossible, as some victims may have drowned or had been incinerated, leaving no remains. Operating from the First Congregational Church, city officials and aldermen began taking steps to preserve order in Chicago. Price gouging was a key concern, and in one ordinance, the city set the price of bread at 8¢ for a 12-ounce (340 g) loaf. Public buildings were opened as places of refuge, and saloons closed at 9 in the evening for the week following the fire. Many people who were left homeless after the incident were never able to get their normal lives back since all their personal papers and belongings burned in the conflagration. After the fire, A.H. Burgess of London proposed an “English Book Donation,” to spur a free library in Chicago, in their sympathy with Chicago over the damages suffered. Libraries in Chicago had been private with membership fees. In April 1872, the City Council passed the ordinance to establish the free Chicago Public Library, starting with the donation from the United Kingdom of more than 8,000 volumes. "Chicago had a weakness for "big things," and liked to think that it was outbuilding New York. It did a great deal of commercial advertising in its house-tops. The faults of construction as well as of art in its great showy buildings must have been numerous. Their walls were thin, and were overweighted with gross and coarse misornamentation." Olmsted also believed that with brick walls, and disciplined firemen and police, the deaths and damage caused would have been much less. Almost immediately, the city began to rewrite its fire standards, spurred by the efforts of leading insurance executives, and fire-prevention reformers such as Arthur C. Ducat. Chicago soon developed one of the country's leading fire-fighting forces. Business owners, and land speculators such as Gurdon Saltonstall Hubbard, quickly set about rebuilding the city. The first load of lumber for rebuilding was delivered the day the last burning building was extinguished. By the World's Columbian Exposition 22 years later, Chicago hosted more than 21 million visitors. The Palmer House hotel burned to the ground in the fire 13 days after its grand opening. Its developer, Potter Palmer, secured a loan and rebuilt the hotel to higher standards across the street from the original, proclaiming it to be "The World's First Fireproof Building". In 1956, the remaining structures on the original O'Leary property at 558 W. DeKoven Street were torn down for construction of the Chicago Fire Academy, a training facility for Chicago firefighters, known as the Quinn Fire Academy or Chicago Fire Department Training Facility. A bronze sculpture of stylized flames, entitled Pillar of Fire by sculptor Egon Weiner, was erected on the point of origin in 1961. St. Michael's Church and the Pumping Station were both gutted in the fire, but their exteriors survived, and the buildings were rebuilt using the surviving walls. Additionally, though the inhabitable portions of the building were destroyed, the bell tower of St. James Cathedral survived the fire and was incorporated into the rebuilt church. The stones near the top of the tower are still blackened from the soot and smoke. A couple of wooden cottages on North Cleveland Avenue also survived the blaze. Almost from the moment the fire broke out, various theories about its cause began to circulate. :56, 90, 232 The most popular and enduring legend maintains that the fire began in the O'Leary barn, as Mrs. O’Leary was milking her cow. The cow kicked over a lantern (or an oil lamp in some versions), setting fire to the barn. The O'Leary family denied this, stating that they were in bed before the fire started, but stories of the cow began to spread across the city. Catherine O'Leary seemed the perfect scapegoat: she was a poor, Irish Catholic immigrant. During the latter half of the 19th century, anti-Irish sentiment was strong throughout the United States and in Chicago. This was intensified as a result of the growing political power of the city's Irish population. :442 Furthermore, the United States had been distrustful of Catholics (or "papists", as they were often called) since its beginning, carrying over attitudes in England in the 17th century; as an Irish Catholic, Mrs. O'Leary was a target of both anti-Catholic and anti-Irish sentiment. This story was circulating in Chicago even before the flames had died out, and it was noted in the Chicago Tribune's first post-fire issue. In 1893 the reporter Michael Ahern retracted the "cow-and-lantern" story, admitting it was fabricated, but even his confession was unable to put the legend to rest. Although the O'Learys were never officially charged with starting the fire, the story became so engrained in local lore that Chicago's city council officially exonerated them—and the cow—in 1997. Amateur historian Richard Bales has suggested the fire started when Daniel "Pegleg" Sullivan, who first reported the fire, ignited hay in the barn while trying to steal milk. :127–130 Part of Bales' evidence includes an account by Sullivan who claimed in an inquiry before the Fire Department of Chicago on November 25, 1871 that he saw the fire coming through the side of the barn and ran across DeKoven Street to free the animals from the barn, one of which included a cow owned by Sullivan's mother. Bales' account does not have consensus. The Chicago Public Library staff criticized his account in their web page on the fire. Despite this, the Chicago city council was convinced of Bales' argument and stated that the actions of Sullivan on that day should be scrutinized after the O'Leary family was exonerated in 1997. Anthony DeBartolo reported evidence in two articles the Chicago Tribune (October 8, 1997 and March 3, 1998, reprinted in Hyde Park Media) suggesting that Louis M. Cohn may have started the fire during a craps game. According to Cohn, on the night of the fire, he was gambling in the O'Learys' barn with one of their sons and some other neighborhood boys. When Mrs. O'Leary came out to the barn to chase the gamblers away at around 9:00, they knocked over a lantern in their flight, although Cohn states that he paused long enough to scoop up the money. Following his death in 1942, Cohn bequeathed $35,000 which was assigned by his executors to the Medill School of Journalism at Northwestern University. The bequest was given to the school on September 28, 1944. The argument is not universally accepted. An alternative theory, first suggested in 1882 by Ignatius L. Donnelly in Ragnarok: The Age of Fire and Gravel, is that the fire was caused by a meteor shower. This was described as "A fringe theory" concerning Biela's Comet. At a 2004 conference of the Aerospace Corporation and the American Institute of Aeronautics and Astronautics, engineer and physicist Robert Wood suggested that the fire began when Biela's Comet broke up over the Midwest. That four large fires took place, all on the same day, all on the shores of Lake Michigan (see Related Events), suggests a common root cause. Eyewitnesses reported sighting spontaneous ignitions, lack of smoke, "balls of fire" falling from the sky, and blue flames. According to Wood, these accounts suggest that the fires were caused by the methane that is commonly found in comets. Meteorites are not known to start or spread fires and are cool to the touch after reaching the ground, so this theory has not found favor in the scientific community. Methane-air mixtures become flammable only when the methane concentration exceeds 5%, at which point the mixtures also become explosive, a situation unlikely to occur from meteorites. Methane gas is lighter than air and thus does not accumulate near the ground; any localized pockets of methane in the open air rapidly dissipate. Moreover, if a fragment of an icy comet were to strike the Earth, the most likely outcome, due to the low tensile strength of such bodies, would be for it to disintegrate in the upper atmosphere, leading to an air burst explosion analogous to that of the Tunguska event. On that hot, dry, and windy autumn day, three other major fires occurred along the shores of Lake Michigan at the same time as the Great Chicago Fire. Some 250 miles (400 km) to the north, the Peshtigo Fire consumed the town of Peshtigo, Wisconsin, along with a dozen other villages. It killed 1,200 to 2,500 people and charred approximately 1.5 million acres (6,000 km²). The Peshtigo Fire remains the deadliest in American history but the remoteness of the region meant it was little noticed at the time, due to the fact that one of the first things that burned were the telegraph lines to Green Bay. Across the lake to the east, the town of Holland, Michigan, and other nearby areas burned to the ground. Some 100 miles (160 km) to the north of Holland, the lumbering community of Manistee also went up in flames in what became known as The Great Michigan Fire. Farther east, along the shore of Lake Huron, the Port Huron Fire swept through Port Huron, Michigan and much of Michigan's "Thumb". 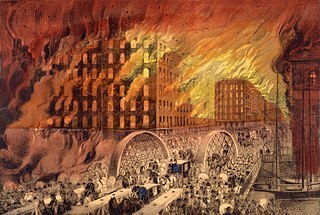 On October 9, 1871, a fire swept through the city of Urbana, Illinois, 140 miles (230 km) south of Chicago, destroying portions of its downtown area. Windsor, Ontario, likewise burned on October 12. The city of Singapore, Michigan, provided a large portion of the lumber to rebuild Chicago. As a result, the area was so heavily deforested that the land deteriorated into barren sand dunes that buried the town, and the town had to be abandoned. The University of Illinois at Chicago athletic teams are named the Flames since 1982, in commemoration of the Great Chicago Fire. Although set in Philadelphia, Theodore Dreiser's 1912 novel The Financier portrays the nationwide impact the 1871 Chicago fire had on the stock markets and the financial world. The 1937 film In Old Chicago is centered on the fire, with a highly fictionalized portrayal of the O'Leary family as the main characters. In 1974, the Chicago Fire football team had played in the short-lived World Football League. Another Chicago Fire played in the American Football Association. Events of the 1986 novel Illinois! by Noel Gerson writing as Dana Fuller Ross occur around the Great Chicago Fire. The 1987 Williams pinball "Fire!" was inspired by the Great Chicago Fire. A cow sound can be heard at the start of gameplay, alluding to Mrs. O'Leary's cow. The 1996 book The Great Fire by Jim Murphy tells the story of the fire for children, and was a Newbery Honor book in 1996. The Major League Soccer team Chicago Fire was founded on October 8, 1997, the 126th anniversary of the Great Chicago Fire. In 2014, the city of Chicago and Redmoon Theater partnered to create The Great Chicago Fire Festival. Held on October 4, 2014, the event fell victim to technical difficulties as replicas of 1871 houses on floating barges in the Chicago River failed to ignite properly due to electrical problems and heavy rain on the preceding days. Horatio Spafford – author of hymn "It Is Well With My Soul"
^ a b c d e f g h i j k l m n o Miller, Donald (1996). City of the Century: The Epic of Chicago and the Making of America. New York: Simon & Schuster. ISBN 978-0684831381. ^ "$222,000,000 in 1871 → 2018 | Inflation Calculator". ^ a b Rayfield, Jo Ann (1997). "Tragedy in the Chicago Fire and Triumph in the Architectural Response". Illinois History Teacher. Retrieved September 25, 2018 – via Illinois Periodicals Online. ^ Pierce, Bessie Louise (2007) . A History of Chicago: Volume III: The Rise of a Modern City, 1871–1893. Republished. Chicago: University of Chicago Press. p. 4. ISBN 978-0-226-66842-0. ^ Owens, L.L. (2007-08-01). The Great Chicago Fire. ABDO. p. 7. ISBN 978-1604538076. ^ a b Murphy, Jim (1995). The Great Fire. Scholastic Inc. ISBN 9780439203074. ^ "The Fire Fiend". Chicago Daily Tribune. October 8, 1871. p. 3. Retrieved November 27, 2007. ^ Abbott, Karen (October 4, 2012). "What (or Who) Caused the Great Chicago Fire?". Smithsonian Magazine. Retrieved February 24, 2014. ^ Signal, Michael A. "The Great Chicago Fire" (PDF). sandiegounified. Retrieved January 22, 2019. Flames even raced right across the Chicago River, feeding on flammable waste in the water. ^ Society, National Geographic (2011-01-25). "The Chicago Fire of 1871 and the 'Great Rebuilding'". National Geographic Society. Retrieved 2019-02-19. ^ Editors, History com. "Chicago Fire of 1871". HISTORY. Retrieved 2019-02-19. ^ "The Chicago Fire". The Greenock Telegraph. 17 October 1871. .
^ Pierce, Betty Louise (1957). A History of Chicago: The Rise of a Modern City. Chicago: University of Chicago Press. p. 7. ^ a b "CPL History, 1871-1872". Chicago Public Library. Retrieved September 26, 2018. ^ "Chicago Landmarks". Archived from the original on May 4, 2009. Retrieved December 14, 2006. ^ a b Schmidt, John R. (July 19, 2011). "The Cider House and the Great Fire". WBEZ Blogs. Retrieved April 4, 2018. ^ Critchell, Robert Siderfin (1909). "Recollections of a Fire Insurance Man: Including His Experience in U.S. Navy (Mississippi Squadron) During the Civil War". The author. Retrieved April 4, 2018 – via Google Books. ^ "The Great Chicago Fire: What Part Did the Celebrated O'Leary Cow Play in Disaster?". Fire Protection Service. National Underwriter Company (82): 10. October 8, 1921. Retrieved April 4, 2018 – via Google Books. ^ Fedler, Fred (August 1985). "Mrs. O'Leary's Cow and Other Newspaper Tales about the 1871 Great Chicago Fire" (PDF). Association for Education in Journalism and Mass Communication. ^ a b c Schwartz, Thomas F. (2005). Foreword. 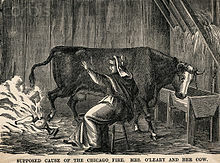 The Great Chicago Fire and the Myth of Mrs. O'Leary's Cow. By Bales, Richard F. Jefferson, North Carolina: McFarland. ISBN 978-0-7864-2358-3. ^ Mannard, Joseph G. (1981). American Anti-Catholicism and its Literature. Archived from the original on October 21, 2002. ^ Kaminski, John P. (March 2002). "Religion and the Founding Fathers". Annotation (National Historical Publications and Records Commission). 30 (1). ISSN 0160-8460. Archived from the original on 2008-03-27. ^ Carroll, Rory (September 12, 2015). "America's Dark and Not-Very-Distant History of Hating Catholics". The Guardian. Retrieved September 25, 2018. ^ Curran, Robert Emmett (2014). Papist Devils: Catholics in British America, 1574-1783. Catholic University of America Press. pp. 201–202. ISBN 978-0813225838. ^ Ellis, John Tracy (1969) . American Catholicism. University of Chicago Press. ^ Cromie, Robert (1994). The Great Chicago Fire. New York: Rutledge Hill Press. ISBN 978-1-55853-264-9. ^ a b Mills, Steve (October 6, 1997). "Mrs. O'Leary, Cow Cleared by City Council Committee". Chicago Tribune. Retrieved September 25, 2018. ^ Bales, Richard (May 12, 2004). "Was Daniel "Peg Leg" Sullivan the Real Culprit? | the Cause of the Great Chicago Fire". thechicagofire.com. Archived from the original on February 23, 2007. ^ "The Chicago Fire". Chicago Public Library. 2009. Archived from the original on May 5, 2010. Retrieved September 30, 2009. ^ Soniak, Matt (June 23, 2014). "Did a Cow Really Cause the Great Chicago Fire?". Mental Floss. Retrieved April 4, 2018. ^ DeBartolo, Anthony. "Who Caused The Great Chicago Fire: The Cow? Or Louis M. Cohn?". Hyde Park Media. Archived from the original on November 24, 2005. ^ a b DeBartolo, Anthony (October 8, 1997). "Col. Mustard with A Bic?". Chicago Tribune. Retrieved September 25, 2018. ^ DeBartolo, Anthony (March 3, 1998). "Odds Improve That A Hot Game of Craps in Mrs. O'Leary's Barn Touched Off Chicago Fire". Chicago Tribune. Retrieved September 25, 2018. ^ Potash, Larry (October 6, 2006). "The Great Debate over the Great Fire". Chicago Tribune. Retrieved September 25, 2018. ^ Wood, Robert (February 3, 2004). "Did Biela's Comet Cause the Chicago and Midwest Fires?" (PDF). American Institute of Aeronautics and Astronautics. Archived from the original (PDF) on March 25, 2009. Retrieved November 27, 2018. ^ Calfee, Mica (February 2003). "Was It A Cow Or A Meteorite?". Meteorite Magazine. 9 (1). Retrieved November 10, 2011. ^ "Meteorites Don't Pop Corn". NASA. July 27, 2001. Retrieved November 10, 2011. ^ "Gases – Explosive and Flammability Concentration Limits". Engineering Tool Box. Retrieved November 13, 2011. ^ a b "Landfill Gas". Environmental Health Fact Sheet. Illinois Department of Public Health. Retrieved November 13, 2011. ^ Beech, M. (November 2006). "The Problem of Ice Meteorites" (PDF). Meteorite Quarterly. 12 (4): 17–19. Retrieved November 13, 2011. ^ Gess, Denise; Lutz, William (2003). Firestorm at Peshtigo: A Town, Its People, and the Deadliest Fire in American History. New York: Macmillan. ISBN 978-0-8050-7293-8. OCLC 52421495. ^ Rosenwald, Michael S. (December 6, 2017). "'The night America burned': The deadliest — and most overlooked — fire in U.S. history". Washington Post. ISSN 0190-8286. Retrieved February 23, 2018. ^ Tasker, G. (October 10, 2003). "Worst fire largely unknown". The Baltimore Sun. Retrieved October 9, 2013. ^ a b Wilkins, A. (March 29, 2012). "October 8, 1871: The Night America Burned". io9. Gawker Media. Retrieved October 9, 2013. ^ "The Great Fire of 1871". History of Manistee, Mason and Oceana counties, Michigan. Chicago: H. R. Page & Co. 1882. ^ "History Of The Urbana Fire Department". Urbana Firefighters Local 1147. March 7, 2008. Archived from the original on April 25, 2012. Retrieved November 11, 2011. ^ Royce, Julie Albrecht (2007). Traveling Michigan's Sunset Coast. Dog Ear Publishing. pp. 58–59. ISBN 978-1598583212. Retrieved May 3, 2014. ^ "History: UIC mascots". The University of Illinois at Chicago. Retrieved September 26, 2018. ^ Dreiser, Theodore (2010). Mulligan, Roark, ed. The Financier: The Critical Edition. University of Illinois Press. Retrieved January 15, 2018. ^ "In Old Chicago | film by King ". Encyclopædia Britannica. Archived from the original on October 12, 2016. Retrieved October 8, 2016. ^ "World Football League". wfl.charlottehornetswfl.com. Retrieved 2019-04-08. ^ AC (2015-08-12). "Chicago Fire, American Football Association". Fun While It Lasted. Retrieved 2019-04-08. ^ Ross, Dana Fuller (1986). Illinois! (Wagons West, book 18). Bantam Books. ISBN 978-0553260229. ^ "Chicago Fire History". MLS (Major League Soccer). February 23, 2012. ^ Pratt, Gregory (October 5, 2014). "Some feel burned by Great Chicago Fire Festival". Chicago Tribune. Retrieved September 26, 2018. Chicago and the Great Conflagration – Elias Colbert and Everett Chamberlin, 1871, 528 pp. "History of the Great Fires in Chicago and the West". – Rev. Edgar J. Goodspeed, D.D., 677 pp. "People & Events: The Great Fire of 1871". The Public Broadcasting System (PBS) Website. Retrieved September 3, 2004. The Great Conflagration – James W. Sheahan and George P. Upton, 1871, 458 pp. Shaw, William B. (October 5, 1921). "The Chicago Fire – Fifty Years After". The Outlook. 129: 176–178. Retrieved 2009-07-30. Smith, Carl (1995). Urban Disorder and the Shape of Belief: The Great Chicago Fire, the Haymarket Bomb, and the Model Town of Pullman. Chicago, Ill.: University of Chicago Press. ISBN 978-0-226-76416-0. 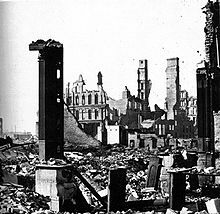 Wikimedia Commons has media related to 1871 Great Chicago Fire.